Hi C & G friends, we have a guest blogger today and I'd love for you to check out her post. Thanks. You don't need to splurge on expensive beauty products to make your skin glowing and beautiful. The secret to glowing skin lies in our kitchen. A healthy serving of fruits can significantly improve the overall appearance of the skin by treating dryness, dullness and pigmentation. 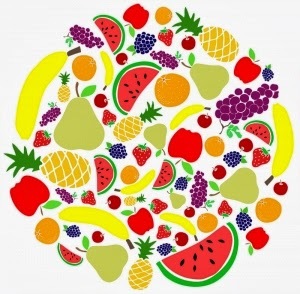 Fruits are cost-effective and have no side effects. Here are ten fruits, which can help you to get a healthy and radiant skin tone. Banana is a staple fruit in India. It is abundantly available throughout the year. It is a good source of iron and magnesium, which stimulates blood circulation in the skin cells. The high levels of Vitamin A in banana work as an anti-ageing agent, preventing wrinkles and fine lines. The potassium in banana moisturizes and hydrates the skin, making it look more supple and youthful. Mash a ripe banana and apply it on the skin like a face pack for that subtle glow. Lemons are a great addition to your beauty regime. It is a rich source of Vitamin C, which aids in the production of collagen. Collagen is a protein that provides elasticity to the skin. Lemon acts as natural bleach, treating uneven skin tone and pigmentation. It also deep cleans the skin by clearing grime from the clogged pores. Mix lemon with honey and massage your skin with it. Start your day with a glass of warm water mixed with lemon juice. The antioxidants in apples prevent cell and tissue damage. The malic acid in apples renews the skin cells, promoting healthy and firm skin. It also contains an abundant amount of elastin that keeps the skin youthful. Apples keep the digestive tract clean by promoting bowel movements, preventing the onset of acne. Apply a paste of mashed apple, honey, rose water and oatmeal to exfoliate the skin. Orange is rich in Vitamin C, a nutrient that helps to improve the skin texture. Rub the inside of the peel on your skin to lighten it. You can also dry and powder the peels to use it as a natural scrub. Regular scrubbing will help to clear the skin blemishes. The skin and health benefits of papaya have been touted since time immemorial. It is rich in papain, an antioxidant that clears the dead skin cells, removing the skin impurities. Applying the pulp of papaya on the skin can do wonders to it. Rinse it off after 15 minutes and follow up with a moisturizer to witness a healthy glow in your skin. It also helps to treat the dark circles and rashes on the skin. The king of fruits doesn’t just taste great, but can be very beneficial for the skin as well. Mango is rich in Vitamin A and antioxidants that regenerate the cells and restore the elasticity of the skin. The beta carotene present in this fruit rejuvenates and revives the skin. Mangoes also reduce dark spots, acne and blemishes, imparting a healthy glow to the skin. Avocados are one of the best natural ingredients for dry skin. Biotin in avocado promotes cell regeneration and growth, resulting in glowing skin. It also contains omega 3 fatty acids, which provides lubrication, alleviating dry skin. Apply mashed avocados on the skin to cure dryness and flakiness. Peaches are one of the best fruits to get an instant face-lift. It tightens the facial muscles, preventing sagging skin. Massage with the inner part of the peel to cleanse and tone the skin. Peaches contain a powerful antioxidant called ellagic acid that prevents collagen destruction. It also guards the skin from UV damage. Pineapple is an excellent fruit to rejuvenate dull and dry skin. It contains bromelain, a natural enzyme that gently exfoliates the skin. Take a slice of pineapple and rub it on the skin and body. The antioxidants also help to neutralize free radical damage. Kiwi is one of the best sources of Vitamin C. Hundred grams of kiwi provide 100 mg of Vitamin C. It heals damaged skin by speeding up the cell regeneration. The ascorbic acid present in kiwi keeps the skin looking young and fresh. Kiwi is loaded with dietary fiber, which acts as a laxative, promoting smooth bowel movements. This, in turn, gives you glowing and lustrous skin. The above-mentioned fruits will not just improve the appearance of your skin, but will also enhance your overall health. Hope you found this article useful. Do leave us your feedback below. Radha Vanga, a new blogger from India. She is a nutrition lover & Ayurveda practitioner. She started her blog www.healthbeckon.com to share what she has learned with other health conscious people. Follow her @healthbeckon or emai her – vineetha@healthbeckon.com. Spring Hair Trend: Color Chalk: Yay or Nay? Rejuvaderm MD Review + Giveaway!